Please open your hearts and your home to a homeless shelter dog. 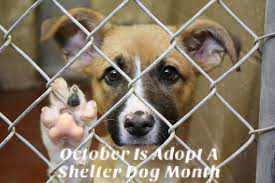 October is Adopt A Shelter Dog Month. There are millions of wonderful dogs available that can bring so much love and joy into your life. There is a myth that somehow if a pet is in a shelter it is because there is something wrong with them. In fact animals are in shelters for no fault of their own but are there due to unfortunate circumstances of their prior owner. You can find a dog or cat of any breed, size, age or color by visiting Petfinder.com Moreover rescues may often have first hand experience with the animal and if you fill out an application they can help you find the right fit. Thinking about adopting? Please don’t wait—-an animal’s life is depending on you.